Years ago we had a metal bracelet for the Model 151, we have been looking for a replacement for several years, and now have a new even nicer bracelet available. The new bracelet can be ordered on a new 151, or can be purchased separately for any RGM 151 we have made in the past. The bracelet is available in 316L stainless steel, it has a push button release clasp with a safety lock. Sizing is easy because the bracelet has screws not pins for removing links, and the solid stainless end-pieces are custom made to fit the 151 case. The clasp is engraved with the RGM logo. The bracelet is available in a brushed and polished combination finish, or we can brush the entire bracelet. We announced a few weeks ago that the Model 400 Chronograph was effectively gone as we were out of enough parts to build more watches. We had many people contact us still trying to order one. We have gone thru the parts and have enough dials, hands, etc.. but we were out of cases. We are having 10 more cases made and can build these last watches in about two months. So if you want a Model 400 Chronograph now is your chance, as of today there are 7 watches available out of the 10 new cases being made. We have not changed the price, the old price is $3500 and we will honor that price. We have all dial variations available for the moment. If you would like to order one a 50% deposit is required and the balance is due when the watch is complete. If you missed RGM on Handcrafted America with Jill Wagner a year and a half ago, you can now see it on Amazon. RGM is on Season 3 Episode 13. Here is a little promo video they did back then. As noted some weeks ago, RGM Watch Company and the National Association of Watch & Clock Collectors arranged for an event, free to the public, during which visitors to the NAWCC HQ could stroll through their extensive collection of clocks and pocket and wrist watches, with Roland Murphy of RGM pointing out and discussing some of his favorite pieces. About 45 people, in addition to Roland, two of his watchmakers (Alan and Benoît) and some members of the NAWCC staff, gathered for the tour. After a quick introduction by Roland, the group watched "Tick Tock Tale", a very clever vintage-style Disney short film (2010) featuring a cast of animated clocks, and then ventured into the galleries. Roland chose several notable clocks and makers to discuss, including clocks by Simon Willard and his brothers, and Seth Thomas. Pocket watches he emphasized included a Patek Philippe Grand Complication, which Roland restored for the museum in the early 1990s, and some very rare and desirable watches from A.L. Breguet (Paris, France) and Wm. Dudley (Lancaster, PA). Examples of machines used for case decoration, similar to the rose engines used at RGM for guilloché, were explained, as were some details of the specifications for railroad-grade pocketwatches such as those from Elgin, Hamilton and Ball. Roland was sure to explain some of the important history of Hamilton Watch Company, of which the NAWCC has an extensive collection (clocks, watches, memorability and documents, including the archives of the original company)--Roland worked for Hamilton in the 1980s and 1990s, but was able to provide history dating back to the company's predecessors such as Adams & Perry and the Lancaster Watch Company. One particularly interesting section of the museum is devoted to watches and clocks made by members of the NAWCC, which sponsors a competition each year where members vie for top honors in 25 categories including watch making, clock making, clock case making, decorative endeavors and others. In this section are some fantastic creations including wooden clocks, tourbillon pocket watches and some of RGM's creations, including RGM watch #001. Originally sold ca. 1992, it was bought back by Roland and has been loaned to the museum. Roland has also provided a prototype Martin guitar, which he and his staff helped design when Martin & Co. were planning a custom piece to celebrate the production of their 2,000,000th guitar. The photos below show some of the action. Those interested in a tour such as this, or a tour of the nearby RGM facilities, should visit RGMWatches.com and subscribe to their newsletter. The next event will be announced there and via RGM's facebook page.. I hope to catch up with you there! Brad Jacobs and Roland Murphy in front of the Prototype of the CF Martin 2 millionth guitar that RGM collaborated on with martin. Just down the road about 8 miles is the old Hamilton factory, now known as Clock Tower Apartments. I kinda want to live there...and work for RGM! RGM’s Roland Murphy will be hosting a free tour of the NAWCC Museum on February 23, 2019 at 10am. The NAWCC is the “National Association of Watch and Clock Collectors” . 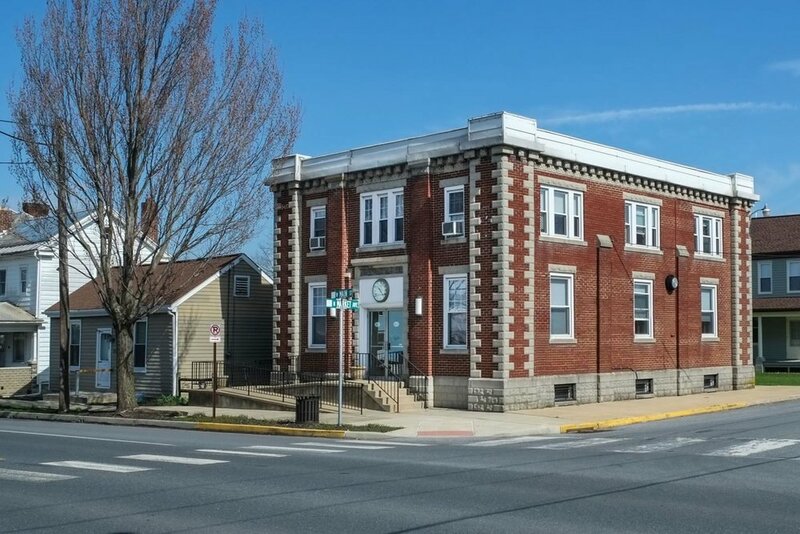 The address is 514 Poplar St. Columbia, PA 17512. No reservation is needed, just show up and mention you are there for Mr. Murphy’s tour. Mr. Murphy has arranged for the normal museum fee to be waived so this is a totally free event. Of course we always encourage donations to the museum, which you can do in person if you so desire. The tour will take about 2 hours or so, and Mr Murphy will feature items in the museum that he personally likes and feels are significant. There are many items of interest in the museum including clocks, watches, complicated watches, watchmaking tools, machinery, and much more. Below is a video tour of the museum Mr. Murphy did several years ago, this will give you an idea of what is in the museum, and if you can’t come in person you can still have a video tour. Also, after the tour if you have an old watch you would like to show Mr. Murphy he will be glad to look at and give you his comments about it. 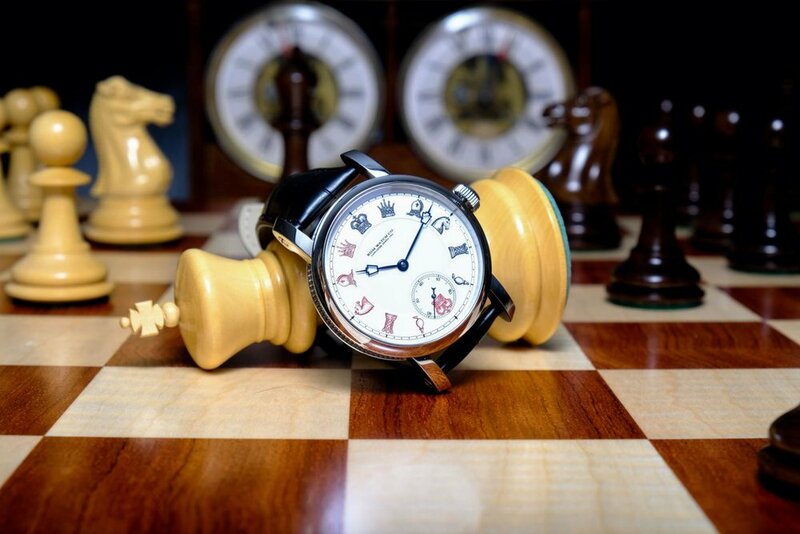 Mr. Murphy has many years experience restoring and collecting vintage and antique watches. For the month of December 2018 only! Purchase or order any RGM Watch and receive the following. This special is for our Newsletter and Social Media followers, so make sure you mention the special when you place your order. The classic double sunk enamel dial is inspired by classic pocket watches from the past. The double sunk enamel dial is made of three separate pieces and then soldered together to make the dial; the same technique that was used on pocket watch dials over 100 years ago. The three different layers of enamel give the dial depth and add to the overall beauty of the watch. 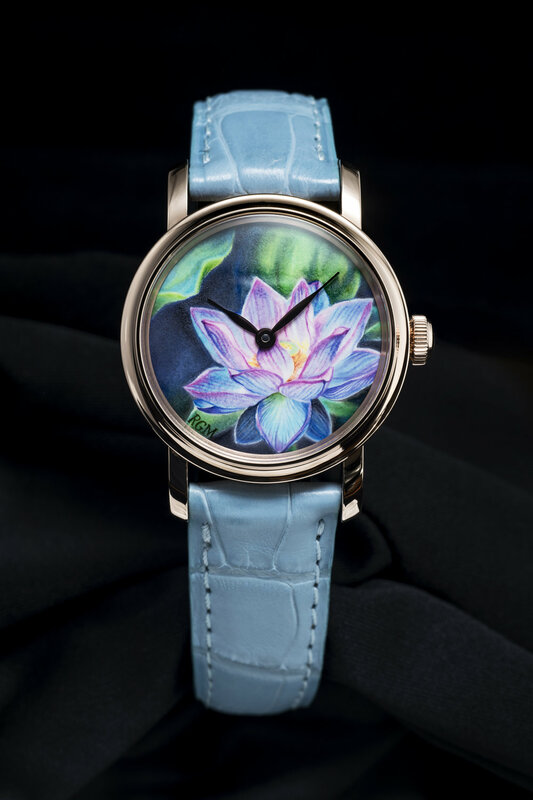 This kind of dial can only be made by a very experienced and skilled enamel dial craftsman. The Grand Feu (French for “Great Fire”) technique was utilized to make these dials. Creating an enamel watch dial is a high-risk art. Enameling is a technique in which powdered glass is applied to a metal plate. The surface is then heated to a temperature high enough to cause the powdered glass to melt and form a new surface. The Grand Feu technique raises the stakes. The repeated baking of successive layers of enamel at extremely high temperatures ensures a uniquely crisp aesthetic while permanently setting the enamel. Using such high heat to create these beautiful dials also poses a risk: each time it is re-fired, the danger of cracking, melting or burning increases. With great risk comes great reward – the appearance of a real glass enamel dial is unmistakable. Under this extraordinary dial is RGM’s original in-house movement: Caliber 801. Inspired by America’s great watchmaking history, the 801 highlights classic bridge shapes, reminiscent of Keystone Howard Watch Company’s Edward Howard model. The unique winding click is inspired by the Illinois Illini model. The entirely hand finished and decorated 801 movement denotes the quality of its construction, including polished and blued steel components. The movement can also be customized. The watch is housed in a polished stainless steel Pennsylvania series case. With its large lugs and ribbed sides, the watch is architecture on the wrist. Like many of the components of the Caliber 801, the case is also made in Lancaster County, Pennsylvania, USA, and finished by hand. 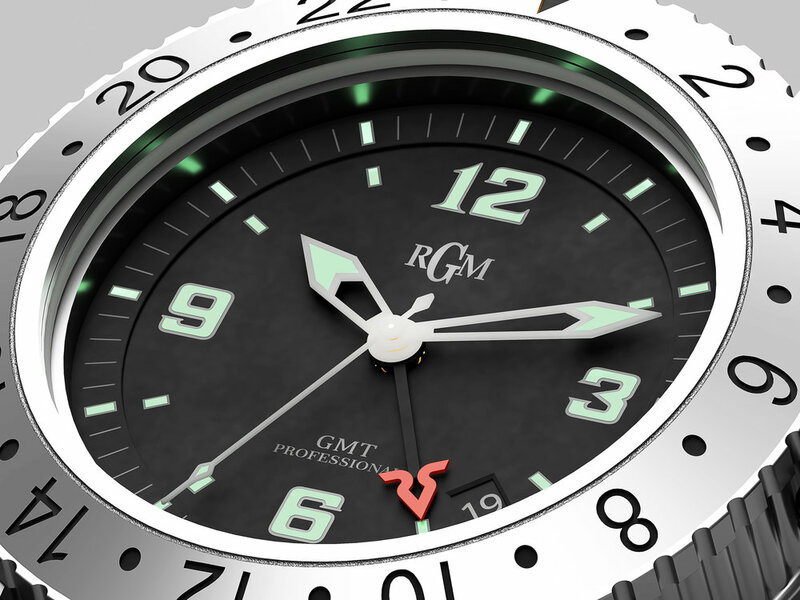 Some images provided by RGM Watch Co. 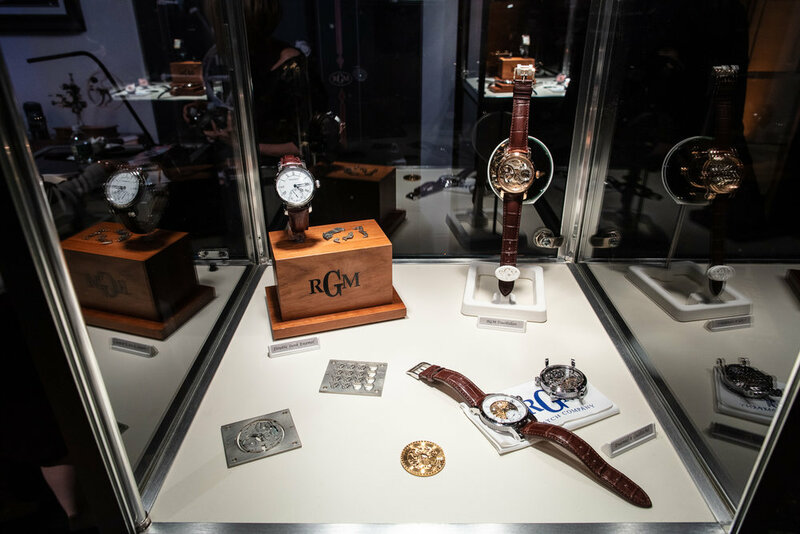 In 2017, the RGM Watch Company celebrated 25 years in existence with a party at the NAWCC Watch Museum and the release of some special timepieces. Earlier in his career, the founder of the company, Roland G. Murphy, had worked as Technical Manager for Hamilton in Lancaster, Pennsylvania when he began independently producing small series of Swiss movement-powered watches from his home in 1992. A quarter-century later, RGM can be found operating from an old bank building in nearby Mt. Joy (image below), where a staff of experienced watchmakers and designers now produce watch movements in-house, apply hand-turned guilloché, and even use locally-made cases, boxes and other accessories. They are internationally renowned as America's finest producer of wristwatches and for keeping many elements of traditional craftsmanship alive. Though some of their movements and parts are still provided by European manufacturers, they are best known for their in-house productions: Caliber 801, a large round movement evocative of the finest American-made pocketwatch movements, Caliber 20, a tonneau-shaped complicated movement introduced for the 20th anniversary of the brand, and the only tourbillon wristwatch ever serially produced in the USA, the Pennsylvania Tourbillon. Alongside the modern marvels they produce, and their devotion to reviving the lost arts of American watchmaking, RGM has also made a name for themselves with their Reference 222 (Roland G. Murphy Signature Series)which almost single-handedly spawned a trend for re-purposing smaller US-made pocketwatch movements of high grade into wristwatches. So it is fitting that they have chosen to issue a revision of the 222 that celebrates another icon of American horology: the Railroad Watch. Christened with reference 222-RR, the new piece utilizes the same basic case as the original 222 (introduced ca. 2005) and is driven by a vintage Hamilton 10-size movement--either Grade 921 or Grade 923, all produced down the road in Lancaster, PA between 1937 and the mid-1950s. RGM no longer offers the lower-grade 917 or 945, choosing instead to focus on the most heavily refined and technologically advanced of the 4 movements in that family. There are two significant and obvious differences between the earlier 222s and the new 222-RR; whereas the 222 used the open-face Hamilton calibers in a "side-winder" format (the crown at 3 and the sub-dial at 9:00) the new 222-RR keeps the crown at the 12:00 dial position,but both the crown and 12:00 are canted a bit clockwise, just to the right of the upper strap lugs. The second difference is the stunning enamel dial, reminiscent of those first used on railroad watches in the mid-1920s. The 222-RR features a dial of true fired enamel, also known as 'grand feu,' whose bold block numerals recreate the style of railroad pocketwatches often called Boxcar Dials. As early as the 1890s, railroadworkers were required to possess watches of certified accuracy and clear readability, intended to deter the possibility of train collisions. A departure from the style of early RR watches, Elgin and other major American firms began to offer the thick, utilitarian numerals seen here beginning in 1924. The connection of this watch to those of the early inter-war years is also reflected in the aforementioned positioning of the crown. During World War I, the benefits of a wristwatch (over a pocketwatch) became evident to servicemen in action. This prompted a surge in production of watches for the wrist among American companies whose watches typically focused on pocket watches for men and considered 'wristlet' watches a novelty or jewelry item, mainly suitable for women. As a result, the watch producers found themselves using the movements of womens' pendant watches as the basis for wristwatches for men. This was a simple transition for hunter-style movements (crown at 3:00, seconds at 6:00) but meant that using open-face movements for the wrist would require the printing of new dials...or make some simple adjustments. Thus, there came into existence examples of 'transitional' wristwatches whose configuration is reflected in today's RGM 222-RR. All 222-RR enamel dials are white with black numerals, and they employ a unique set of hands created especially for this model. They are blued steel in the traditional railroad shape, but their aesthetically pleasing proportions are specific to this watch. The example 222-RR shown here is motivated by a Hamilton Grade 923, made in 1946. Although Railroad specifications through the 1920s-1960s required a watch of 16-size, in order to keep the 222-RR manageable for the wrist, employing a 10-size movement was necessary. Happily, the Hamilton 923 (23 jewels, fewer than 3600 produced) and its sibling Grade 921 (21 jewels, approx. 54,000 produced) were highly refined and adjusted for accuracy that helped them meet or exceed expectations of railroad accuracy. That they were built in Lancaster, PA, a short drive from RGM's home, reinforces the noteworthiness of this watch, the first to combine such significant American watchmaking history with a modern homage to the great railroadmen's watches of yore. Before building any vintage Hamilton caliber in to a Ref 222, a single RGM watchmaker performs restoration and improvement activities--installing a new purpose-made mainspring, polishing any discolored parts to better-then-new condition, and executing a complete overhaul and lubrication. The balance is poised, the movement is adjusted and monitored then, only after having been cased and observed for some days, it is approved for release to its new owner. Due to the size of the classic movement RGM uses, the 222 watches measure 41.0 mm x 12.0 mm, in cases of 316L Stainless Steel. Sapphire crystals are installed front and back; water resistance is 5 ATM. RGM supplies the 222-RR on sturdy Hirsch Liberty leather straps with ample thickness, contrasting stitching and 22mm width tapering to 20mm ends. A shapely steel buckle is provided, subtly engraved with the RGM logo. 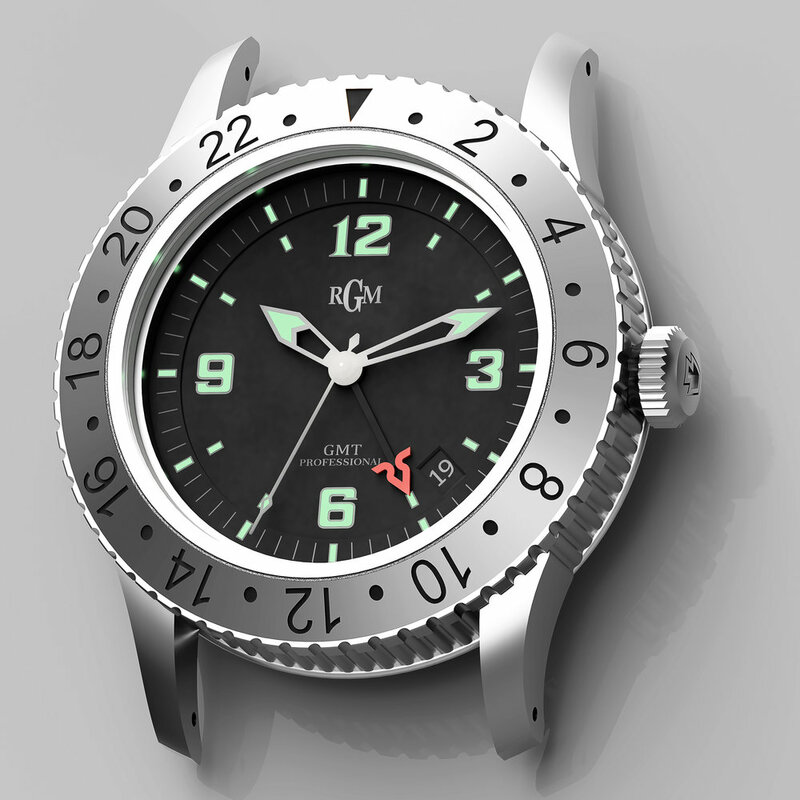 Prices for the RGM 222-RR begin at $5900 US for an example with Grade 921 movement. 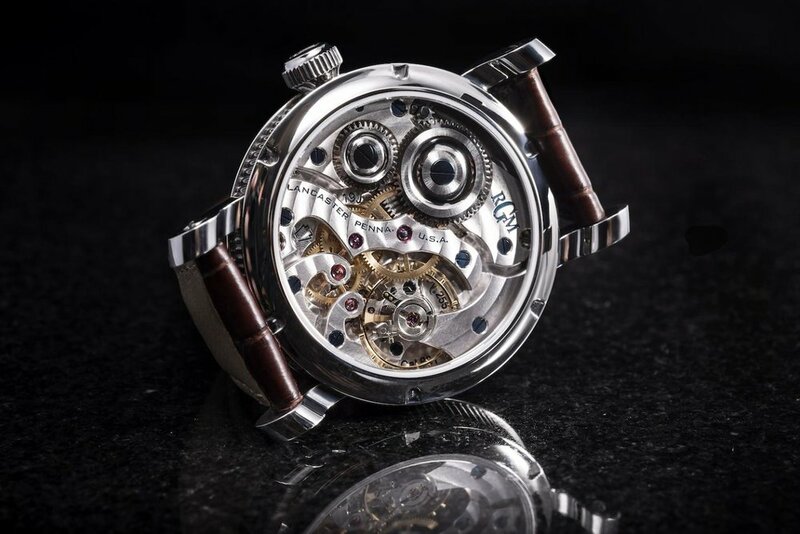 The price of $7900 for a watch with the Grade 923 movement reflects the extreme difficulty of obtaining (and atmospheric rise in prices asked for) Grade 923 movement and parts in the requisite exemplary condition to be considered for use in an RGM watch. Although Hamilton produced hundreds of thousands of movements in the 917/945.921/923 family, barely over 300 Grade 923s (on average) left the Hamilton factory during each year of its production. Having now owned this piece since the middle of 2018, and an RGM 222-E since 2005, I'm quite comfortable with its size. It is comparable to many watches powered by modern ETA 6497/6498 movements (e.g., Eberhard Traversetolo, Chronoswiss TimeMaster, Panerai, etc) and perhaps a bit more wearable than some. The 222-RR has a fairly thin bezel, so the 41mm case admirably manages to act as a subtle showcase for about 37 millimetres of dial. As the dial is true enamel, with the reflectiveness and amazing contrast typical of that material, the case and bezel would be easy to ignore, but for the substantial size of the lugs (which, frankly, I would prefer to be less obtrusive). The fantastic dial is accentuated by the unusual angle at which it is displayed--the overall effect has retained its novelty for months now--and I find myself drawn to admire this watch as often as to tell the time. As with all RGM watches, the quality of their production (and of the components provided by their external suppliers) is top-notch, so there are no distractions or complaints here. Any inadvertent oversights in their quality department are quickly rectified--this I know through personal experience. But more significant to me is that every element of this watch is harmonious. The lustre of the dial, the depth of the sunken seconds register, the hue and shape of the hands, the weight of all the printed elements, the color of the straps, the design itself--everything combines to give the wearer the impression of having a true railroad watch for the wrist. The rear view of the watch does just what it should. It simply and directly (again, a thin bezel is key here) provides one a window into another time. Although RGM has made subtle improvements to the movement within, it remains an example of the highest-quality American made movement of its class and, though not a true RR-grade watch (as described above) it is surely the most apt substitute, whether in 23- or 21-jewel form. The 222-RR looks and feels like a little piece of 20th-century history for the wrist and I consider it to be another significant accomplishment by RGM in their quest to represent and maintain the high horological standards of American watchmaking. Back in 1988 I worked in Product Development for Hamilton Watch Co. in Lancaster , PA here in the USA. Hamilton had a line of retro watches which were remakes of models they had made back in the 30’s, 40’s, and 50’s. I worked for the Vice President in charge of Product Development, he asked me to put together a watch for Robin Williams because they needed a period looking watch for his upcoming movie (Dead Poets Society). We also had the watch engraved to commemorate the movie. I had never seen the watch again since 1988 until a few days ago when a picture of it turned up in a newsletter about the auction of Mr. Williams collectibles, it was nice to know that he held on to the watch all those years. The watch model was the Hamilton Cabot. Seeing that picture reminded me of other movies I had put watches together for. Older version of a Sugar Bowl watch but the logo was the same. Also, the Hamilton movie watch was yellow gold-filled. Also, back in the 1980’s when working at Hamilton I put a watch together for Dennis Quaid, the movie was called (Everybody's All-American). They needed a 1950’s looking watch with the Sugar Bowl logo on the dial. Hamilton still had a gold-filled, top loading automatic watch in their line that looked like a 1950’s or 60’s watch. My department was also in charge of the logo watches they made back then, and Kenny Derr who had worked there since the 50’s had a bunch of old dials. I was able to find an original 1950’s dial from is junk box. I fit the old dial to the new watch and it looked just like an original watch that would have been given to the players back in the 50’s. I wonder where this watch is today? Maybe Mr. Quaid still has it. In the late 1990’s Albert Brooks who I had met at a watch show contacted me, he asked if I would supply a few watches for him to wear in his up coming movie (The Muse). Of course, these were RGM watches, he wore an RGM 101M, and a stainless steel RGM chronograph in the movie. If you look at the movie credits RGM is mentioned. I am told Mr. Brooks still has these watches today. Thanks for listening to my little walk down watch, and movie memory lane. Here is a picture of me in June of this year visiting my old friend Philippe Dufour during my last trip to Switzerland. I first met Philippe just a few years after starting RGM, this was back around 1993/94. This was long before he was well known as he is today. During my many trips to Switzerland back when I was younger I would often stop and see him, and spend a little time talking about watchmaking. I remember visiting him at his house back when his workshop was in the attic, he had a computer in front of him and he was working on the CAD design of a perpetual calendar for Daniel Roth. I remember him telling me that Daniel Roth ask him to make nice curves, he wanted classic beautiful shapes in his watch. Philippe would do some work back then for other watchmakers, like he did back in the day building Grande Sonnerie pocket watches for Audemars Piguet. I took my wife by to see Phillip and see what he was working on. He let me take a few pictures of his current project a Grande Sonnerie pocket watch very much like the ones he made many years ago for AP. He also pulled out of his vault two of his Simplicty watches, number #000 and #001, the very first ones! Philippe is the only person I know who calls me by my last name, he’s being doing if for more then 20 years. It makes me smile when I see him somewhere and hear “Murphy”! Previous post about the watch click here. Last Fall, to help the NAWCC ( National Association of Watch and Clock Collectors) raise money to support the museum, we made and donated a special custom RGM watch to commemorate the 40th Anniversary of the museum. Here is the blog with more information click here. Just a half a year or more later the NAWCC is celebrating the 75th Anniversary of the organization. We decided to make another custom watch to commemorate the 75th. This watch is one of our RGM Model 455 Chronographs with a few changes. We have printed "NAWCC 75 Years" on the dial, and we have hd a beautiful hand engraving done on the case-back of "Tommy Ticker", the same image on the side of the NAWCC Museum. I have had a long relationship with the NAWCC from the first time I visited the museum with my father back in 1979. In the 1980"s and 1990's I volunteered restoring clocks and watches for them, and from the early 2000's to present we have had several RGM events there, and worked closely with them to further the preservation of timepieces, and interest in all things Horology. We hope you will consider bidding on the NAWCC's 75th Anniversary Custom RGM watch. 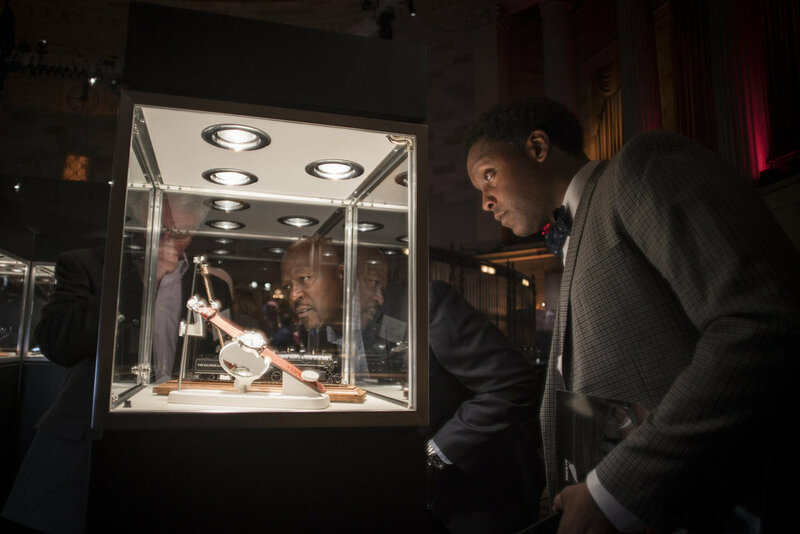 All proceeds will benefit this fine organization that is dedicated to preserving the history of Horology. William Penn founded the state of Pennsylvania in the USA, promising many fundamental freedoms, including the freedom of religion. As a result, many immigrants, fleeing religious persecution, came to and settled in Pennsylvania (including the Amish). 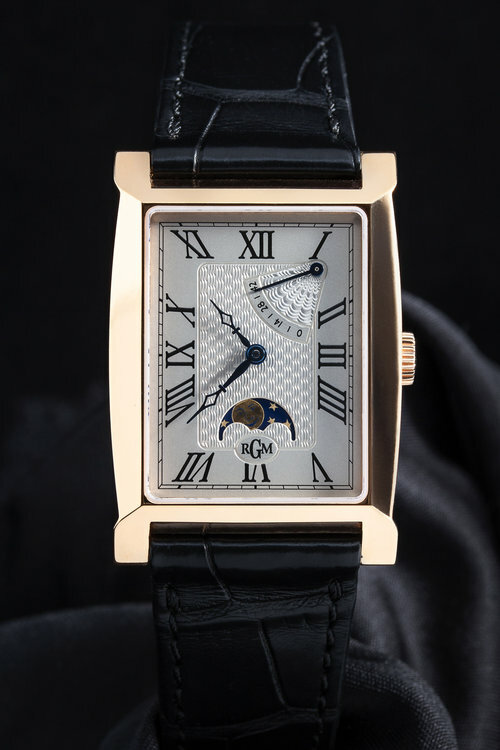 RGM, based in Mount Joy, PA, debuted the William Penn collection, consisting of three models (one with sub-second, one with date and one with a moon phase), about 18 years ago. Now, RGM is reissuing the William Penn in a moon phase version only, using new old stock. The William Penn is available in 316L stainless steel or 18K rose gold. I was one of the 5 craft people featured during the 2015 Balvenie Rare Craft Collection Tour; Mr. Bourdain picked the final 5 that were included. We did the 3 day event in New York, Houston, and Chicago, from October to December 2015. I had the opportunity to talk with Anthony on a number of occasions and enjoyed the atmosphere of these events. We have many fond memories. Just a few weeks ago we were contacted about doing an episode of Raw Craft with Anthony. We were looking forward to working with him again, and having him come visit us here in Pennsylvania. Everyone at RGM extends our sincere condolences to Anthony Bourdain's family and friends.